It was very productive weekend, aside from the complete debacle that was my dyed-silk pennant project; I think I’ve established what I did wrong (short answer: too much dye) and at least one of the two banners I worked on is moderately acceptable, so I’ll at least have that for Crown Tourney. 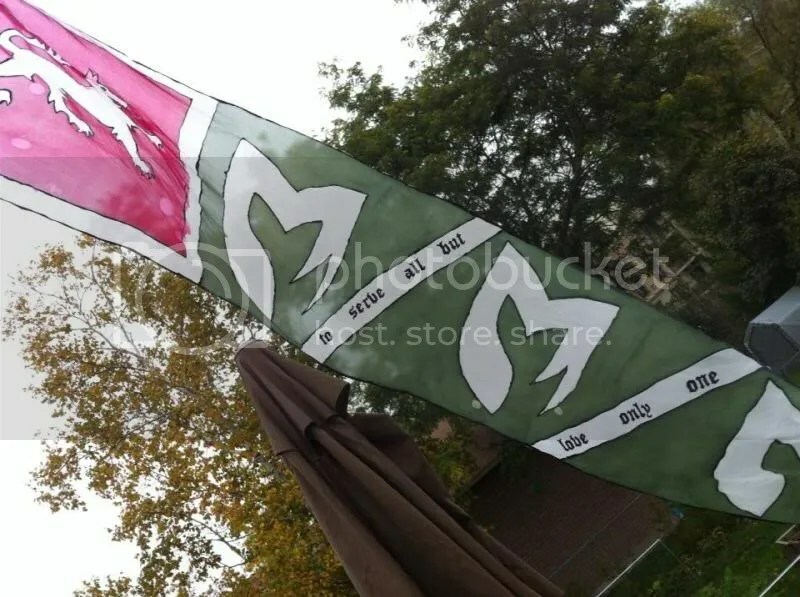 My first attempt at a silk banner. Ignore the bleed-through bits and the spotting where the dye didn’t take properly. 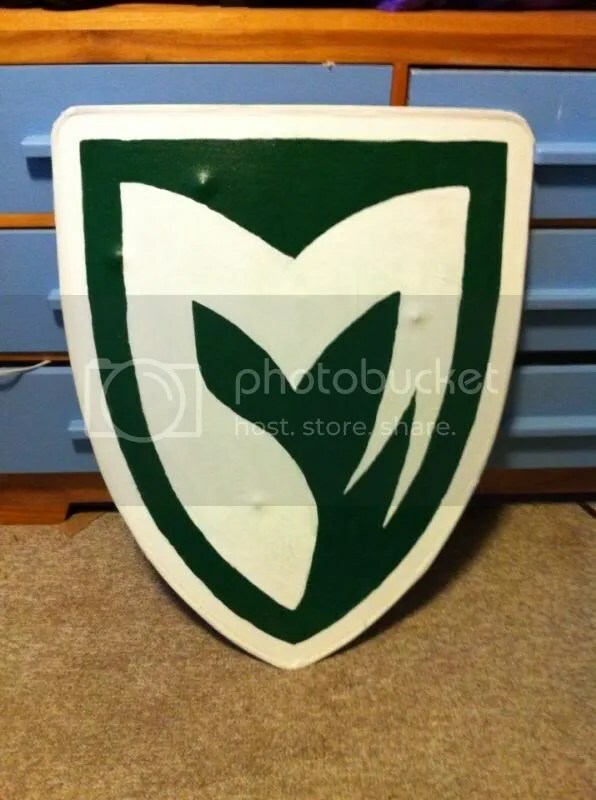 I also finished up both my shields, my tournament shield and my war shield. The primary difference between the two is size — the war shield is half a foot longer and two inches wider than the tournament shield. That doesn’t sound like much, I know, but six inches of extra length covers me from chin to knee, and the extra width adds quite a lot of protection. What it also adds is weight: the war door isn’t going to be nearly as handy as my tournament shield. Not that it matters as much in the press of a shieldwall, of course: you’re packed in so tightly that moving the shield to block isn’t really an option. I’m also pleased with how the colours worked out — the deep red of the Kingdom War Badge is particularly nice. The clear-coat makes it shiny. Hopefully that’ll also keep it from picking up too many scuffs and stains on the list field. So I’m feeling good about being ready for Crown, at least cosmetically. Now I’ve got to worry about being physically ready for it: I’ve been doing some pell-work here and there, but the next couple of weeks is going to be the real training: I’ve got a fight practice tomorrow night, a fighting event in the East Kingdom on Saturday, then another fight practice at Caldrithig next Wednesday… and then Crown Tourney itself. It definitely helps that I’ve lost a lot of weight: I’m forty-three pounds lighter than I was six months ago… or as I like to put it, “one whole armour bag.” That’s going to make a huge difference in my endurance, I have no doubt. I still have to write that speech, though. Fortunately I’ve gotten advice from friends, and the overall gist seems to be “talk about love and keep it short,” which I can do. We’re not going to Pennsic this year. Let’s get that on the record right off the bat: We’ve got a wedding to pay for in September and something like 80% of the company I work for is active in the SCA (the other 20% is formerly-active) so I didn’t even bother trying to book time off for Pennsic. We’re also skipping one of Ealdormere’s premier camping events, the annual Battle of Baron’s Howe on Labour Day weekend, because North Bay’s a long, long drive and it’s three weeks before the wedding. The next event we’re planning on attending is a local(ish) one in mid-September called Icelandic Althing, and that’s just going to be a quick day trip. So most of our SCA stuff over the next couple-three months is going to be either practices or project time. Build a “war door” — for non SCA-types a “war door” is SCA slang for a shield that’s too big for tournament (according to the admittedly vague rules about that sort of thing.) 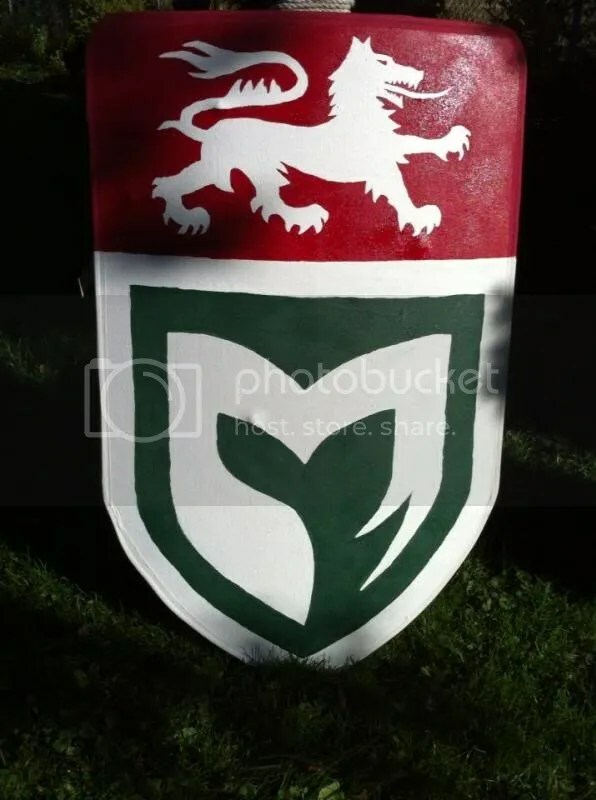 I’m hoping to send some cash with a friend down to Pennsic to pick up an aluminum shield blank, and from there I can build one pretty quickly. During the melees at Trillium War I came to the conclusion that a bigger shield is going to be handy if I’m going to keep getting stuck in the front rank of the shieldwall by virtue of the fact that I’m a very big guy. Rebuild my tournament shield — my current tournament shield (as illustrated on the header graphic of this blog) has been up and functional for about three years. It needs some TLC… and better edging. What I plan to do is strip off the canvas, drill holes around the edge of the shield, and then re-face it in fresh canvas and edge it properly with leather before repainting it… and giving it a proper clear-coat this time, instead of having to touch up my paint job every six months; I’ve probably got half a pound of layered paint on the front of my shield it by now. Build a silk-stretching frame and make a couple of silk pennons for myself and The Fiancée. I know how to do it, we’ve got the silk and gutta-percha to do it, and I even know what I want to put on it. I just have to run down to Home Depot to get some 1x3s and then spend twenty minutes knocking the frame together and then getting to it. Make a heraldic “hall-hanger” banner. We ran across some gorgeous green brocade which was on sale dirt cheap at the fabric store a couple of weeks ago; it’s too heavy (and polyester-laden) to make a surcoat, but it’ll work nicely as a banner for heraldic display at an indoor site. Build some sort of stand to hold weapons and my shield upright when not in use. The “armour dump” approach to event sites makes me completely mental, especially at indoor events where space is limited. Just tossing everything into a big heap is ugly and a huge hassle to work with. I figure with a couple of sawhorse hinges and some basic woodworking skills I can make a stand or a rack or something that will pack down flat and yet look reasonably neat and tidy when in use. Build spaulders. This is going to be a fairly serious metalworking project… and one which I’ve never tackled before. There’s going to be a lot of learning involved, but I figure it’ll give me a basic introduction to pretty much all of the skills I’m going to need in order to make plate armour in the future, so why not challenge myself? Build new demi-gauntlets. I gifted my old leather demi-gauntlets to a new fighter recently, so I’m currently without demi-s in my kit. That’s not a huge issue — I don’t personally fight with a basket hilt and I’ve modified my tournament shield so that I can use it with the full gauntlets I’m currently using, but it would be nice to have a spare pair, just in case. Also, if I can figure out how to make demi-gauntlets relatively quickly and easily, that’ll be a useful skillset for the future. Build hourglass gauntlets. This is a project that’s been “on hold” for more than a year at Master B’s shop, but it’s one I hope I can get back into high gear soon — my current mitten gauntlets are actually on extended loan from another fighter, and eventually he’s going to ask for them back. The good news is, of course, that once I’ve been run through the basics (and maybe used some of the more specialized tools) I can do the bulk of the work in my own shop on my own time, and then go back to Master B for pointers on the finer stuff. I also need to get together a regular practice routine in the backyard. Going to fight practice once or twice in a week is fine, but I think I need to spend more time working at the pell. My technique, as I’ve mentioned before, could use some work, and certainly my weight loss plan won’t suffer for half an hour of regular sweating in the evenings. Which I suppose leads into the last item on my list: re-pad the pell. Right now my pell (an upright post in the backyard for practicing sword-strikes) is wrapped in about 200 feet of sisal rope… which has been sitting out, exposed to all weathers, for about three years. The rope is worn, grey and in places rotting out. It looks pretty bad, and it’s also a bit disconcerting to be practicing an on-side wrap and end up knocking loose half a dozen earwigs. Also, it’s a lot less effective at reducing wrist-shock than it was.